Fig. 16. This 56-yr-old female with acute inferior MI had sustained junctional bradycardia. 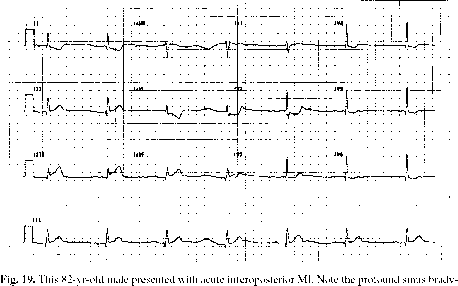 Because of hypotension, atropine was administered, with acceleration of the ventricular rate. descending artery (PDA), which is a branch of the RCA in 80% of patients. In addition, the left anterior descending artery (LAD) provides some collateral flow to the AV node. The bundle of His and proximal right bundle branch (RBB) are supplied by the AV-nodal artery and septal branches of the LAD. Most of the RBB and the anterior fascicle of the left bundle branch (LBB) are perfused by septal perforators of the LAD, and the posterior fascicle of the LBB receives blood from the LAD and PDA (111). Fig. 18. In this patient with anterolateral infarction, persistent SVT was noted. Although AVNRT could not be excluded, the clinical syndrome appeared consistent with nonparoxysmal junctional tachycardia (NPJT). Sinus bradycardia (see Fig. 19) occurs in 10-41% of cases of AMI (112-115), and is especially common within the first hours of infarction (113). 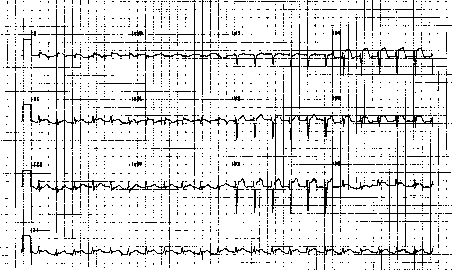 Sinus bradycardia and junctional bradycardia (see Fig. 16) are more common with IMI and inferoposterior infarction (IPMI) than anterior MI (113). The incidence of bradycardia and hypotension is higher in patients treated with early iv beta-blockers (39,85) although the need for treatment with atropine or temporary pacing because of hemodynamic compromise is not more frequent. In IMI, the mechanism of bradycardia with or without associated hypotension is generally believed to be a manifestation of the Bezold-Jarisch or vasovagal reflex, which accompanies both ischemia and reperfusion of the inferior wall (116). Cardiac receptors—more numerous in the inferoposterior than in the anterior portion of the left ventricle—transmit impulses via nonmyelinated (C-fiber) vagal afferents. A brainstem reflex results in efferent vagal stimulation of the heart (117). 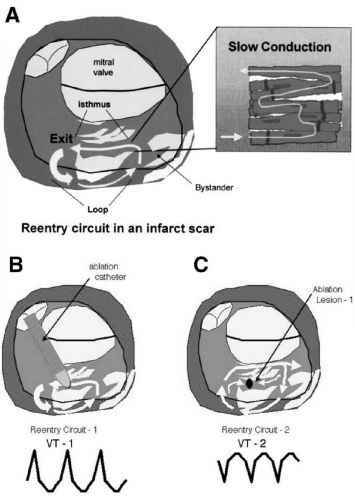 Teleologically, this reflex may be protective in the setting of AMI; experimental and clinical evidence suggests that vagal stimulation within the first few hours of infarction may enhance electrical stability, thus reducing the likelihood of VF. In addition, sinus bradycardia may occasionally develop as a result of ischemia or infarction of the sinus node or surrounding tissue. cardia and first-degree A-V block. blocker therapy might be optimal in AMI. 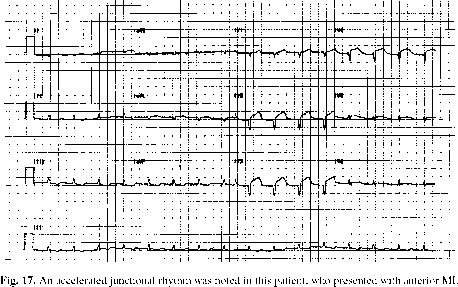 For profound asymptomatic sinus bradycardia, beta-blocker therapy should be held. Pain, nausea, and medications such as morphine and nitroglycerin have also been associated with vasovagal-type decreases in blood pressure and heart rate (119). When sinus bradycardia is associated with symptoms and/or hemodynamic compromise, atropine should be administered intravenously, initially in small doses (0.5-1.0 mg). A paradoxical increase in vagal tone, and therefore more profound bradycardia, is rarely seen after small doses of atropine (120). Sequential iv boluses may then be given to a total dose of 2.0-2.5 mg (2). If administered in the first 4-6 h after infarction, atropine is frequently effective in treating bradycardia and accompanying hypotension, particularly if hypervagotonia is the cause. It should also be noted that several cases of atropine-induced VF have been reported in the literature (121,122). Sinus bradycardia that occurs more than 6 h after the onset of chest pain is often transient. It may be caused by sinus-node dysfunction, infarction, or ischemia rather than vagal hyperactivity, and tends to be less responsive to atropine. If atropine is unsuccessful in abolishing symptomatic bradycardia, a temporary transvenous pacemaker may be inserted into the right atrium or right ventricle to accelerate the heart rate. 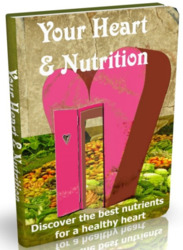 Isoproterenol, which is a positive chronotropic and inotropic agent, should be avoided except under extreme circumstances, because this agent markedly augments myocardial oxygen demand.